One of the most important things that any sales manager can do for his or her company and career is create a top performing distribution team. The thing that puzzles us is when sales leaders leave it up to chance. Some managers think they can just hire the right people, let them run, and the sales will come flying in. If you have been in the business for as long as we have, you know that isn’t true. A coach doesn’t build a great team by leaving them to their own way of doing things. A great coach comes in and level sets the whole team to the same systems and processes. If you want to accomplish everything you desire for yourself and your team, you owe it to yourself to bring in a structured approach that defines “How” to reach the objectives and goals set forth for your organization. Target Marketing addresses client segmentation, determining specific profiles for top prospects and high potentials along with establishing meeting objectives and activities. We operate under the presupposition that on average it takes 7 -12 contacts to convert business. That means you have to be in front of the right clients all the time. Territory Management delves thoroughly into refining territories for more efficient travel and client coverage, scheduling appointments, time leverage issues and working with your team. Sales professionals need an efficient way to cover large amounts of geography and strategically be in front of the most clients. Sales Process is all about the soft skills. Sales Process helps you define and prepare for high impact appointments and the steps necessary to prepare, execute and follow-up on those select appointments and presentations. The 80/20 Principle (Pareto’s Law) observes that 80% of the results flow from 20% of the causes. It is an empirical ‘law’ that has been verified in economics, business and interdisciplinary science. You can experience our programs off the shelf or we can tailor your experience to your team. What you get has been field tested, and it’s the exact system we’ve taught to over 30,000 sales professionals who have sold billions worth of products over the past 20 years. 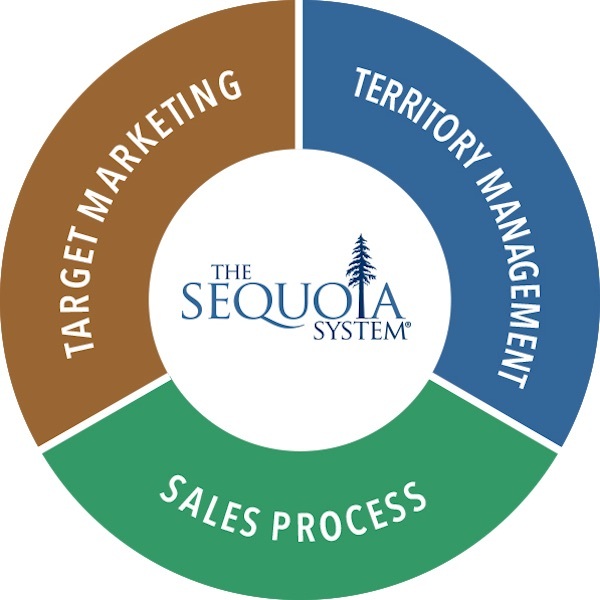 This is dramatically different from anything you’ve ever been taught in sales because The Sequoia System is more of a “field guide” to building strong territories than a traditional sales training. The reason why is because there’s no fluff or filler. The Sequoia System immediately gets down to brass tacks, showing you exactly what to do, how to do it, and why.